The following program calculates the efficency of a propeller according to some parameters. This program does only apply to the carbon E-PROPS propellers, with their specific profiles and their fine chords. Those values cannot be reached with other propellers. Replace the values given for example with your own data, and click on button CALCULATE : you obtain the efficiency of the prop and the speed on the blades' tips. This simplified modelization allows a first approach for information purposes. It does not take into account the mechanical aspects imposing on blades a certain geometry. It calculates the propeller's efficiency at a specified point of functioning. This modelization is precise @ + / - 5%. E-PROPS engineers realize more pushed calculations and more detailed analysis to define the aerodynamic geometry and the mechanical behavior of the blade under load, as well as the precise performances in the various points of functioning. The LmPTR© software has been finalized in this purpose. 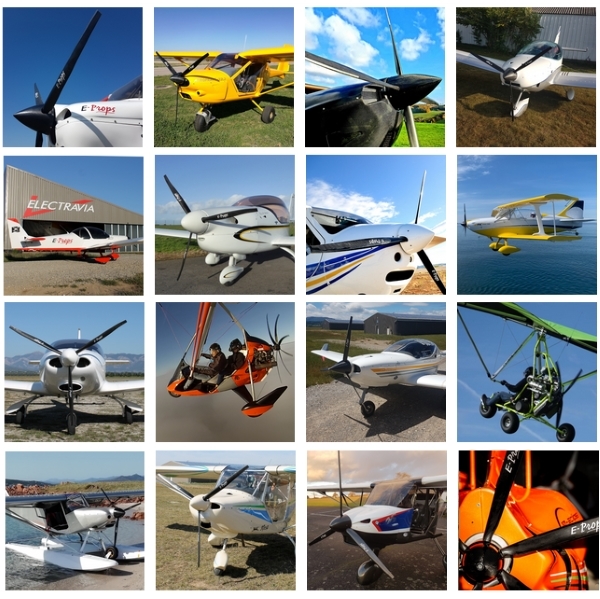 Every E-PROPS propeller is realized for a specific configuration and engine, and naturally according to the pilot's specifications.